Software Cradle released SC/Tetra 11. WindSim made their solver more accurate for wind farm simulations such that annual energy production can be improved 3-10%. Included in ANSYS 15 is parallel export of FieldView’s FVUNS files. CFD simulation of a ship’s propulsor computed using ReFRESCO. Image from MarineLink.com. A worldwide consultancy is looking to hire a Process Engineer with CFD experience for their London location. Volt needs to hire a CFD Analyst/Engineer in Chicago. Altair has an opening for a CFD Development Director in California. Students from the Univ. of Texas at Austin won the Student Cluster competition at the recent Supercomputing conference with a GPU-based system. Competitors must build a system that consumes no more than 3,000 watts using only donated equipment. Pieterjan Platteeuw of CNH Belgium N.V. won CD-adapco’s 2014 calendar contest with his image of a combine harvester. By moving to a cloud-based HPC service, bicycle maker Trek reduced their CFD run times from 13 hours to 40 minutes. The use of CFD in testing a truck’s adherence to mileage and emission standards may be growing. 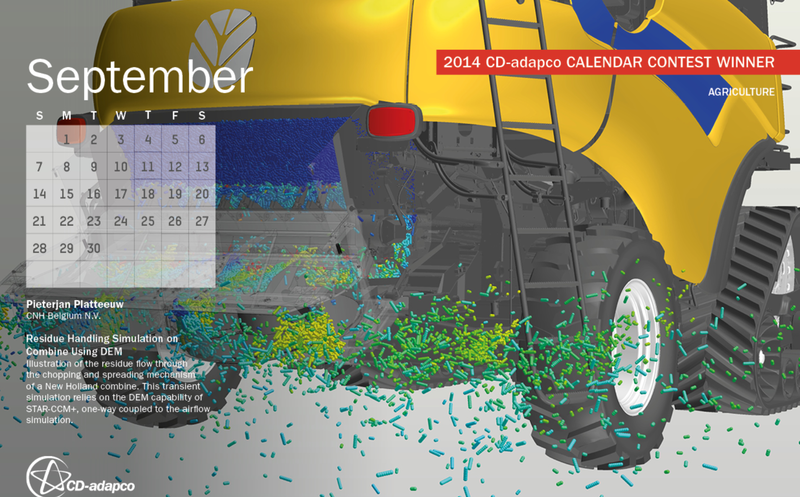 The winning entry from CD-adapco’s 2014 calendar contest. 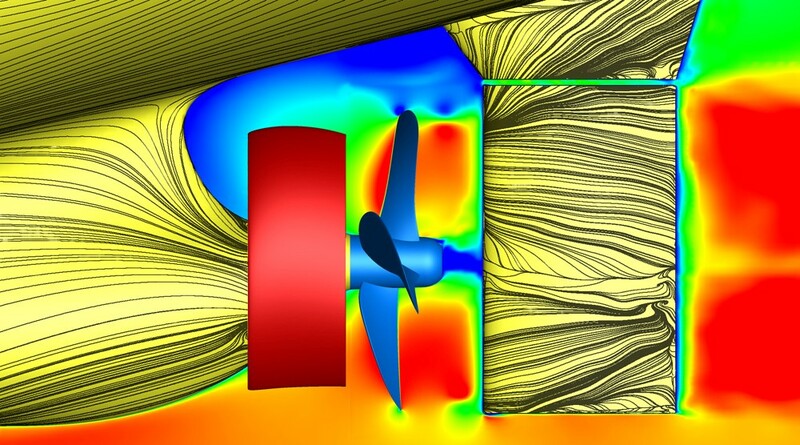 The 1st International Conference in Numerical and Experimental Aerodynamics of Road Vehicles and Trains will be held 23-25 June 2014 in Bordeaux, France. Two-page abstracts are due by 31 January. For CFD-related news from Autodesk University see this video blog from IMAGINiT. The NAFEMS Americas 2014 Conference will be held in 28-30 May 2014 in Colorado Springs in conjunction with the Collaboration & Interoperability Congress (CIC). The call for presentations deadline is 29 January 2014. You might want to attend CIC after reading in this Desktop Engineering article that anywhere between 30-70% of an engineer’s time is spent making CAD geometry ready for analysis. TotalSim is now offering a “bespoke CFD hardware solution.” For example, a 192 core cluster with 1,024 GB RAM can be had for slightly over £48,000. Back issues of CD-adapco’s Dynamics magazine are available online. ANSYS merged with Reaction Design, makers of CHEMKIN-PRO. You might want to review the list of winners of Aviation Week’s Twenty20s Awards, Tomorrow’s Engineering Leaders, because someday one of them might be your boss. These twenty students, from B.S. to Ph.D. candidates, were recognized not only for academic performance but for their activities outside the classroom. Who would’ve thought that a comet’s tail oscillates in a way that looks a lot like the flow behind a sphere? We think of space as a vacuum but even the solar wind can cause a comet’s tail to fluctuate as seen in these NASA images. Click for an animation from Popular Science. In case you wonder why I post something each week that’s supposed to be beautiful, consider this quote from a Nobel prize winner: “knowledge without imagination is barren.” Read more about why science needs imagination and beauty. This entry was posted in Applications, Events, Hardware, News, Software and tagged Altair, ANSYS, Cascade Technologies, CD-adapco, CHEMKIN, Esteco, Exa, FIeldView, IMAGINiT, jobs, modeFrontier, NAFEMS, Reaction Design, ReFRESCO, SC/Tetra, TotalSim, WindSim. Bookmark the permalink.